Issue 86 of Apex Magazine is Out Now! Apex Publications is proud to announce the release of issue 86 of our science fiction, fantasy, and horror zine, Apex Magazine. This month we have original stories by Jennifer Giesbrecht and Christopher Shultz, plus a reprint by the wonderful C.S.E. Cooney. Our poetry selections are by David Jibson, Rodney Gomez, Jon Olson, and Chris Phillips. Michael A. Burstein has a wonderful nonfiction feature for us with Andrew Fazekas about Star Trek and the universe. Jennifer Giesbrecht was kind enough to chat with our author interviewer Andrea Johnson about writing, comics, and her fantastic story “Lazarus and the Amazing Kid Phoenix.” Our artist interviewer Russell Dickerson delves into the beautiful work of our cover artist Sunny Ray. As you probably have heard, Mahvesh Murad has joined the Apex Magazine team as our new podcast producer. I know you’re as excited to hear her rendition of Jennifer Giesbrecht’s “Lazarus and the Amazing Kid Phoenix” as I am, but due to an equipment issue, there has been a slight delay. Podcast #37 should be up and running by July 12th. Until then, we’ll all wait in eager anticipation. 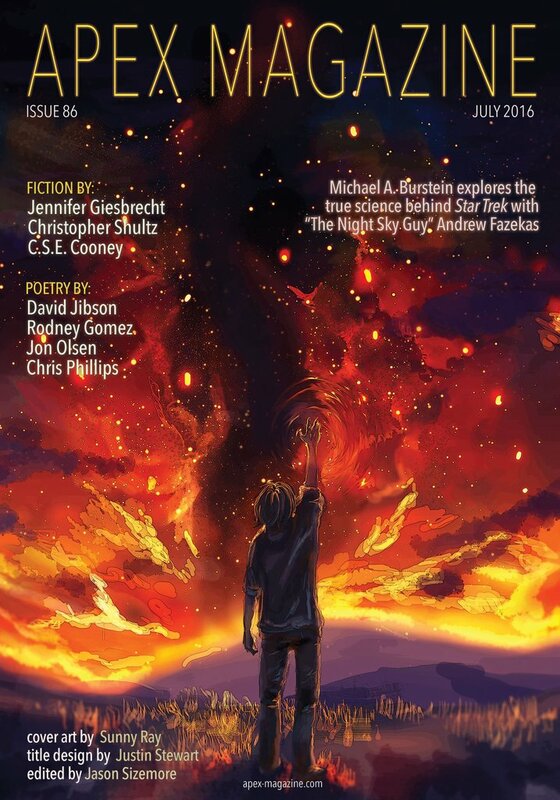 You can read Jennifer Giesbrecht’s story “Lazarus and the Amazing Kid Phoenix” and Jason Sizemore’s “Words from the Editor-in-Chief” today on the Apex Magazine website (http://www.apex-magazine.com/issue-86-july-2016/). Our release schedule for the rest of this month’s content is also there. We have new content to post all month long! Read the entire July issue of Apex Magazine today by purchasing the eBook edition for only $2.99! Ebook editions are available direct from Apex (http://www.apexbookcompany.com/collections/apex-magazine-all/products/apex-magazine-issue-86), or through one of our many online retailers.